The general consensus of opinion, is that self hosting a WordPress blog is the best way forward for blogging success. It provides the most flexibility and control over your writing platform. The problem is, what happens if you don’t want to spend time setting up a hosted domain? What if you are not sure how? That might be the time to consider a hosted solution in the cloud. Hosting WordPress in the cloud means that all the server/database requirements are looked after for you. All you have to do is start creating your content. Well, nearly. There will be a small amount of setting up to do. 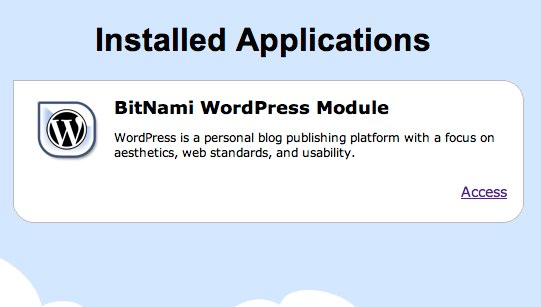 In this article I’m going to show you how to set up a WordPress blog using the popular Amazon EC2 cloud, with a little help from BitNami. 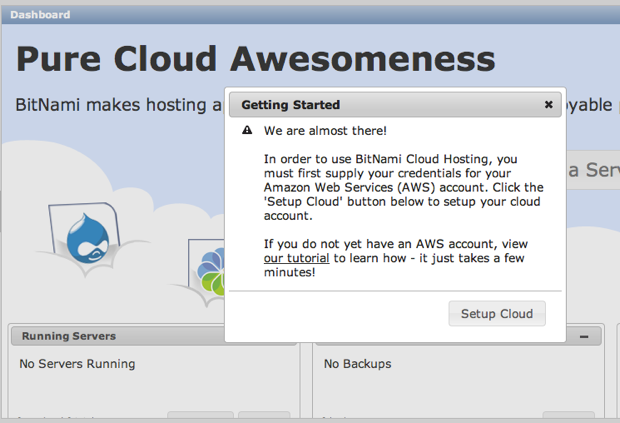 So what that means is, we can get ourselves an Amazon Web Services account, and then use that to host a Bitnami WordPress installation. Then you’ll be writing in the cloud in no time. Point your browser at http://aws.amazon.com and click the “Sign Up” button. You can run a micro server for 1 year free at the moment, so be sure and choose the “I am a new user” option. Don’t confuse this Amazon account with your Amazon retail account. The AWS system is completely different. You will then go through a typical sign up form, and you will be prompted to enter credit card information. However, you will not be charged for the first year if you run a single micro server. The final part of the account sign up involves Amazon’s automated service phoning you on the number you provided in the contact details section. It will ask you to either type, or say the pin number that will appear in your browser window. I found typing it didn’t work, whereas speaking it worked immediately. You will then receive an email welcoming you to the service. It will contain links to the AWS portal where you can find the access keys you will need to use the service. We’ll get back to those shortly. 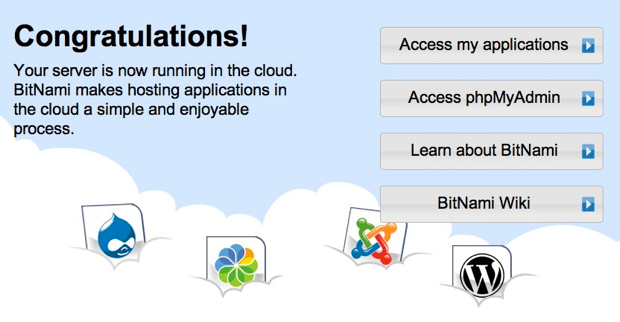 First, you need an account with the BitNami cloud. Amazon EC2 in the raw is not for the faint-hearted. There is quite a lot to learn about: how to deploy to it, and config it. Enter BitNami. 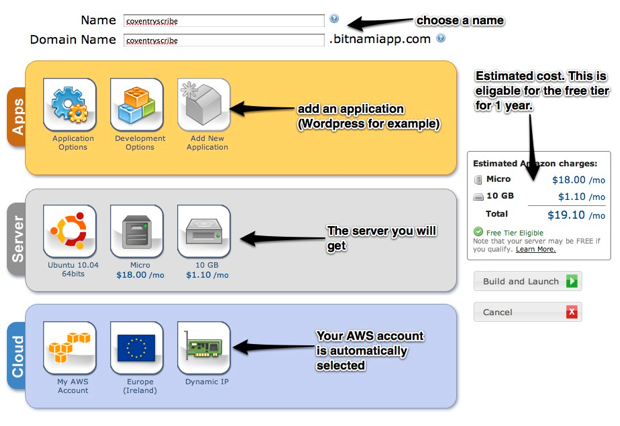 By deploying to your Amazon cloud via BitNami, all the technical pain is dealt with. A properly configured server, with the operating system, and required software installed. The application(s) you want to run installed just by clicking a button. Any database requirements installed and configured for you. 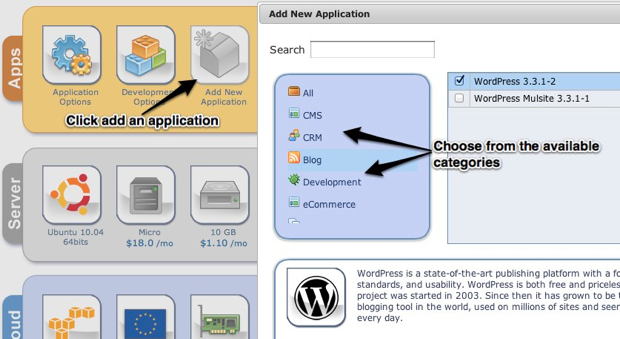 Since we are focusing on WordPress, that’s the application we’ll choose. You should also add email credentials via the Email Configuration tab. This is so that you can receive emails from your WordPress site. Now you can hit the build and launch button, and go and have a cup of tea. 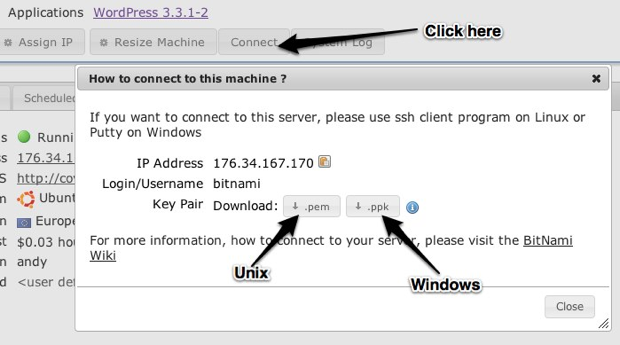 Bitnami will now create your server and set it running for you. You even get a nice email from them once your server is up and running. Click the Access link, and there, in all its glory, will be your WordPress installation. Add ‘wp-admin’ to the url in the address bar, and you can access the normal WordPress administration panel. Thant will ensure that only you have read/write access. If you are on Windows, follow the advice in the Bitnami wiki. Make sure you put the .pem file somewhere easy to remember! You will then have shell access to your server. Though, there is no particular reason that you need to do this as most of the common server management tasks can be carried out from the web admin area in your Bitnami account. But if you like to dabble in the more technical side of things, you have shell access to achieve that. It is probably wise to take a breath and think through want we have here. A full WordPress installation hosted on Amazon EC2. Not only that, but it needed no real technical server knowledge to get up and running. It certainly isn’t the cheapest way to run a WordPress installation once the free year is up, but it has to be one of the most painless ways to get a fully configured Linux server up and running, and on a cloud hosting service too. Andy Hawthorne is from Coventry in the UK. He is a senior PHP developer by day, and a freelance writer by night, although lately that is sometimes the other way around.